Good morning, Eagles fans. The Eagles won the Super Bowl. What else needs to be said? Their storybook season ended with their first Lombardi Trophy. There will be much to discuss in the coming days, with a parade coming and further dissection of one of the greatest Super Bowls ever played. For now, read along for five postgame thoughts, links to all our coverage, and answers to your questions. And you can expect much more coverage in the coming days. This is a post-Super Bowl edition of the Early Birds newsletter. If your friends haven't subscribed, it's free to sign up here to receive the newsletter in your inbox. I want to know what you think, what we should add, and what you want to read, so send me feedback by email or on Twitter @ZBerm. Thank you for reading. Eagles coach Doug Pederson and quarterback Nick Foles celebrating after beating the New England Patriots for the Super Bowl LII title on Sunday. On the biggest stage of his career, Nick Foles excelled. He deserved Super Bowl MVP. Foles went 28 for 43 for 373 yards, three touchdowns, and one interception. He also caught a touchdown. The moment wasn't too big for him, and he was clutch in the fourth quarter. Foles made key throw after key throw, especially on the final drive. It's amazing to think there were questions entering the postseason about whether Foles would get pulled. He went 77 for 106 for 971 yards, six touchdowns, and one interception with a 115.7 quarterback rating in the playoffs. This is not to take anything away from Carson Wentz, but I don't know if the Eagles would have gotten a better postseason from Wentz — at least the past two games. That's how impressive Foles has been. "I think the big thing that helped me was knowing that I didn't have to be Superman," Foles said. He played within the offense, his teammates believed in him, and Doug Pederson called an outstanding game. I have covered Foles' entire time in Philadelphia and have seen him at different stages of his life and his football career. There were tough moments and tough questions he faced, and he's now a Super Bowl champion and MVP. 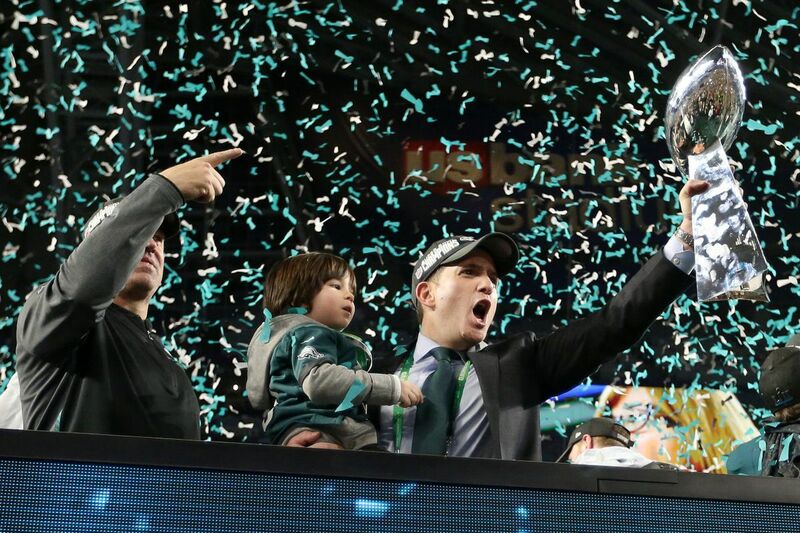 When Foles was on the stage during the trophy presentation holding his daughter, you could see a well-earned smile. "Being on the podium with my wife, Tori, my daughter, Lily, that's what life's about right there," Foles said. "We're Super Bowl champs, but time does stop when you look in your daughter's eyes and you get to celebrate this moment. I got to look in my wife's eyes. I get to celebrate this with her. They've been there. My wife's been there through everything. My family has been there through everything. To be in this moment, to celebrate this moment, that's what it's about, and I'm just grateful." Doug Pederson was the best version of himself in the Super Bowl. He was creative and aggressive as a play-caller and decision-maker. I liked the fourth-down decisions — they were 2 for 2 — and the touchdown at the end of the first half will go down in Super Bowl history. He was not afraid to call that play in that moment, and it worked. He also hit the right notes with the players — they were prepared, conditioned, and resilient. The team's leadership has a lot to do with it, but it must start with Pederson. Entering the year, I thought it was reasonable to wonder if he'd be on the hot seat. Now, he might deserve a statue erected for him at some point. When speaking with a small group of reporters in Philadelphia before the Super Bowl, Pederson said the reality of coaching is that he would be fired one day. That day isn't on the horizon anytime soon. Pederson proved to be an outstanding coach in every tangible and intangible way. Going forward, Pederson should be viewed as a major asset — whether it's on game days or during the week. "I trust my players, I trust the coaches, and I trust my instincts. I trust everything that I'm doing, and I want to maintain that aggressiveness with the guys," Pederson said. "In games like this against a great opponent, you have to make those tough decisions that way and keep yourself aggressive." The Patriots totaled 613 yards, so it was not a banner day for the Eagles defense. The Patriots didn't even need to punt. But when the Eagles needed a play the most, they made it. The only sack of the game was Brandon Graham's strip sack. When Brady took the field for that drive, I'll admit it: I thought he was going to drive down to score. I thought the team with the ball last would win. But the Eagles proved otherwise. "We don't care how many yards we gave up," safety Malcolm Jenkins said. "We were just trying to win. We obviously have a lot of respect for Brady and that offense. He obviously is the best to do it, and we understand that. The way it went, it was just going to come down to whoever got the last stop. Our offense did a good job of putting up points. We knew they were going to score. When they went down on that last drive, we just looked at each other and said that this was the moment we have all been waiting for. Just get that one last stop, and we were able to come up with it." It's true what Jenkins said: Defensive coordinator Jim Schwartz doesn't make a big deal about yards. He makes a bigger deal about points, and it's about making winning plays. The defense made a winning play on Sunday. I didn't get a chance to talk to Schwartz after the game, but I bet he would emphasize that. The Eagles will return most of their defense next season, and I'd expect them to be even better. They must figure out linebacker, but they should be better in the secondary and they have depth on the defensive line to continue to threaten teams. Howie Roseman can take a bow. This is a Super Bowl roster, and much of it has to do with the work during the past two years. Alshon Jeffery, LeGarrette Blount and Derek Barnett were high-profile acquisitions who made big plays. But what about undrafted rookie Corey Clement with 100 receiving yards in the Super Bowl? The investment Roseman made at backup quarterback helped the Eagles win a ring. Up and down the roster, the Eagles had the top-end talent and depth they needed to win. They won Sunday because they were the better team. I wrote in my prediction that if I removed the history and the mystique and just looked at the matchups, the Eagles were better. That the Eagles had a more talented roster Sunday says something about what's happened during the past two seasons. "I'm happy," Roseman said. "Nobody can ever say we're not world champions. Ever. I'm happy for our owner. I'm happy for our coaches. I'm happy for our players. The only people who believed we had a shot to do this were the people in the NovaCare facility after Carson got hurt. He's a great player, he's the MVP, but it's about the team. It's always about the team. These guys, they knew it; they knew it all along. They said it. They have great leadership. The people in this room, the coaches, the players, they deserve a tremendous amount of credit. And we're bringing the Lombardi Trophy back to … Broad Street." The postgame locker room was interesting to observe. Obviously, there's a euphoria that can be experienced only through winning the Super Bowl. There was a level of happiness on the faces of these coaches and players that I'd never seen before, and I've covered every game for six years. There were hugs and long embraces; screaming and singing and dancing; they chewed cigars and sprayed champagne and sipped scotch; there were some players taking in the moment, others who were participating. They posed for photos with the Lombardi Trophy. They recorded the celebration on social media. Pederson and Jenkins spoke. There are two takeaways from the celebration above all else: Team members genuinely like each other; and that postgame locker was a culmination of every practice and walk-through and meeting and game that have taken place all season. It's rare to put as much into a season as these players do and get this kind of payout; usually, a season ends with relative disappointment. Not the Eagles this year. "This trumps everything," linebacker Mychal Kendricks said. "Nothing else even matters. … There's a point in time where you just don't give a damn. And [celebrating] was that time. Because all the hard work, I would never [celebrate like that]. Are you serious? You'd get in trouble. But you win the Super Bowl. Do you understand what we just did, bro? First time in Philly history!" Eagles vice president Howie Roseman shouts while holding the Lombardi trophy after Super Bowl LII. The story from the Eagles' first Super Bowl victory looks at the significance of the moment, the game-changing plays, and behind-the-scenes in the locker room. Jeff McLane writes about the play of the game — "Philly special." Doug Pederson called the game of his life in the Super Bowl, Les Bowen writes. Marcus Hayes writes about Nick Foles winning Super Bowl MVP. Bob Ford writes about the Eagles winning the "greatest Super Bowl ever held." Mike Sielski writes about Alshon Jeffery coming through on the biggest stage. David Murphy writes about a team that embodies the city. Corey Clement, the local undrafted running back, is now a part of Super Bowl history, Mike Jensen writes. Frank Fitzpatrick writes about a defense that made a big play a big moment. Hayes writes on the scene in the postgame locker room. Paul Domowitch offers his grades from the win and five observations. Bob Brookover went to the Patriots locker room to write about Tom Brady; Marc Narducci tackled the Patriots defense. Malcolm Butler was benched and the Patriots defense couldn't stop the Eagles. Butler thought he could have changed the game. This ending will sting Tom Brady. Rob Gronkowski will consider retirement. Will the team do what Foles wants? Like if he wants to stay here as backup even if there are good offers out there for him, will we honor his wishes? I hope so. I can't imagine Nick Foles would rather stay here as a backup if he has a sure chance of starting somewhere else — and earning a lucrative contract. And I think the Eagles will set a high price. They really like Foles, they prioritize the No. 2 quarterback spot, and Carson Wentz is recovering from a major injury. They don't need to move him, so they hold all the leverage. It will be an intriguing story line this offseason. Foles' previous starting stint did not end well, but he's the Super Bowl MVP. I imagine there will be demand. The question is how much. Does Carson realize that none of this happens without him? Yes, I do think Carson Wentz realizes that. And that point was reinforced to him by the coaches. Wentz is still very much involved, and he was enjoying the moment with his teammates. It's obviously not the same as if he was the starting quarterback, but the Eagles wouldn't have been in the Super Bowl without Wentz. And if he can continue to play as well as he did this year, they should be back in this situation with him. Tom Brady happened. He is the best quarterback in NFL history and played an outstanding game Sunday. That said, the Eagles' pass rush wasn't effective enough for much of the game. I wrote going into the game that the Eagles would lose if Brady had a clean pocket. In the fourth quarter, when it mattered, the pass rush got home and made the play the Eagles needed. As for Jalen Mills, I think he is a starting-caliber cornerback and has shown it this season. I still think the cornerbacks are the weakness of the defense, and they didn't play well Sunday, but Mills made a lot of plays this season and this postseason. He's definitely worth keeping. It's not even a question in my mind.